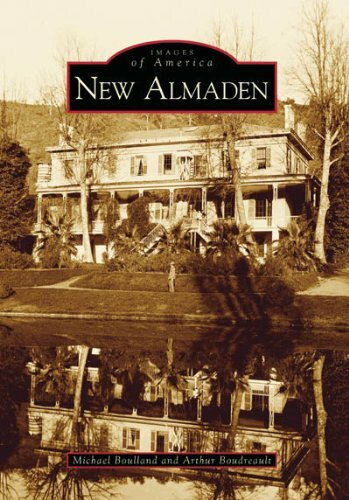 In a rocky, wooded canyon south of San Jose lies New Almaden, a settlement that grew near the oldest and richest mine in California. Discovered in 1845, its quicksilver payload was once crucial for gold and silver processing and manufacturing munitions. It produced over $75 million from the deepest network of quicksilver shafts on earth. Diverse laborers populated this thriving town, creating neighborhoods called Hacienda, Englishtown, and Spanishtown, along with the mine manager's stately home, Casa Grande. Although the mines are now closed and the great ore furnace cold, the Casa Grande still stands along with a residential community that was placed on the National Register of Historic Places in 1963. Coauthors Michael Boulland, a lifelong teacher and author of local history books including the Legend of Santa Teresa, and Arthur Boudreault, writer and archivist at the New Almaden Mining Museum, are both active in the community and are directors of the New Almaden Quicksilver County Park Association. Unearthing the best images from the mining museum's archives, they highlight the long vein of history that runs through this town, once vital to the economy of the state.